Rogers second-grader Owen Vybiral Stewart gives a presentation on good citizenship to the Board. At Rogers Elementary, positive behavior and good citizenship are part of every school day through Positive Behavior Interventions and Supports (PBIS). To teach families how PBIS could be used at home, Mark Church, Rogers guidance counselor and PBIS coordinator, sought help from someone with proven success using PBIS outside of the classroom. Enter second-grader Owen Vybiral Stewart. Owen, with the help of his mom, created a PowerPoint presentation about how he learns to make positive choices and be a good citizen as part of his family. He gave this presentation to a large crowd at a recent Rogers Family Learning Center event, and gave it again Monday night to the Board. Owen told the Board about being a respectful, caring member of his family. He discussed learning how to manage money by saving his allowance and budgeting for things he wants (like a new toy helicopter). He also demonstrated how to be a good citizen, with examples including volunteering with the Animal Rescue League and shoveling a neighbor’s sidewalk without being asked. On Monday afternoons everyone at Miller Middle School can expect “Mama Cat” and “Bob Cat” to appear on their television screens. The duo star in Manner Up!, a new video series produced by and starring Miller staff and students with messages about good manners and respect. Language arts teacher Mary Fitzgerald portrays “Mama Cat”, while “Bob Cat” is social studies teacher Bob Gilbertson. Media specialist Dave Stanfield is in charge of filming the videos, which along with Fitzgerald and Gilbertson will feature a variety of Miller students and staff. The first video – “Dare Not to Swear” – premiered Monday, March 12. Following the 11-minute video, classrooms had discussions about behavior expectations and being held accountable for them. A new video will premiere every Monday afternoon for the rest of the school year. School breakfast and lunch prices will increase 10 cents in 2012-2013. According to the Healthy, Hunger-Free Kids Act of 2010, food service programs with an average lunch cost of less than $2.46 must increase costs a minimum of 5 cents and no more than 10 cents in any year. In 2011-2012 Marshalltown Community School District’s average lunch cost was $2.02. For 2012-2013 K-4 breakfast will be $1.05 and lunch will be $2.05. For grades 5-12 breakfast will be $1.10 and lunch will be $2.20. Adult breakfast will be $1.45 and lunch will be $3.10. Individual milk costs will remain 30 cents. There is no change in the cost for reduced-price meals as those are set by Federal guidelines. The Marshalltown Area Health Careers Club will tour Mayo Clinic in Rochester, Minn., on Friday, March 23. The Board approved the out-of-state trip, which includes 28 students from Marshalltown High School and other area schools. The club began last year and includes monthly activities for students. This trip is being sponsored and financed by Marshalltown Medical and Surgical Center, Iowa Jobs for America’s Graduates, Marshalltown Area Health Careers Club fundraisers, and Gear Up. The Board approved an addition project at the Support Services Building. The three-story addition will add a stairwell and elevators to the building, as long as parking, creating an entrance that will eventually serve as the main entrance for district offices. A future project will be the renovation of upper floors to move the district central office and board room from the 317 Columbus Drive Location. The addition will be built at the location of the 1927 Anson Middle School building, which is slated for demolition. Total anticipated project costs are $1.5 million. The entire district is working very hard on improving student behaviors, and tonight’s Board meeting included two really neat examples of how PBIS is playing out in two of our schools. 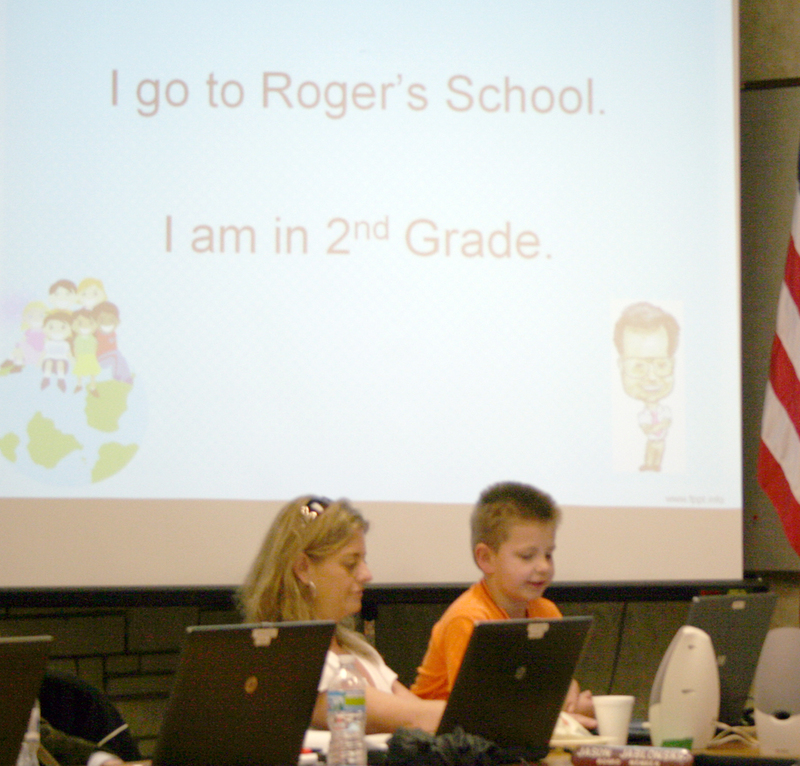 Rogers second- grader Owen Vybiral Stewart gave a power-point presentation which he had created. In it he explained how his weekly allowance is based on his behaviors, giving concrete examples of how positive behaviors increase his allowance and how poor choices made “when my brain is tired” result in decreases. This young man has internalized valuable information and then shared it; I was impressed! The second example came from Miller Middle School. Two teachers have teamed up to create weekly videos featuring “Mama Cat” and “Bob Cat” who use humor to illustrate different positive behaviors. The videos are clever and entertaining while strongly emphasizing their message. After each video is shown, classes have the opportunity to discuss the week’s featured behavior, and then it is strongly emphasized throughout the building during the week. This evening the Board of Education approved Policy 100 (District Philosophy, Mission, Beliefs, and Expectations). Strategy 5 that accompanies this policy states, “MCSD will improve student achievement through efficient stewardship of district resources.” One way this stewardship can be demonstrated is by systematically planning for current and future facility needs of the district. Tonight’s meeting included discussion about plans to update the District Capital Improvement Project List. This document is different than the MCSD Facilities Plan frequently mentioned during board meetings. The Facilities Plan, presented to the Board in March 2010, contains rationale and design information for 10 projects between 2010 and 2015, including Fisher Elementary, preschool classrooms, MHS second floor classrooms, and the MHS Roundhouse renovation. The Capital Improvement Project List is much broader in scope. This document contains a comprehensive list of buildings and grounds improvements recommended for every District facility, compiled from numerous sources, including staff, community members, and external inspectors such as the Fire Marshall or Office of Civil Rights. This list hasn’t been recently reviewed, so seven steps will be taken to update the document: 1) remove everything from the current list that’s no longer relevant (e.g. completed projects or outdated cost estimates); 2) seek widespread input from district staff and community users of MCSD facilities; 3) create one list that contains all recommended projects; 4) administrative staff identify priority projects; 5) present documents from steps 3 and 4 to the MCSD Design Advisory Committee for its review and possible revision; 6) present Design Advisory Committee recommendations to the Board; and, 7) present an updated Capital Improvement Project List to the Board every spring. District administrators and the Board look forward to receiving suggestions for the Capital Improvement Project List during the coming months. This is an important step toward ensuring that taxpayer dollars continue to be invested in a manner consistent with the priorities of the district and the community it serves. Pete Drury, MHS counselor and head 7th grade boys track coach, effective at the end of the 2011-2012 school year. Laurie Muilenburg, Woodbury paraeducator, effective March 23, 2012. Gail Snyder, MHS food service, effective March 16, 2012. Rich Collins, school bus driver, effective March 12, 2012. Susan O’Neill, Woodbury Title I teacher. Start date: 2012-2013 school year. Salary: MA Step 5. Amy Troup, MHS paraeducator. Start date: March 20, 2012. Salary: $9.48/hour. Micah Donelson, Miller food service. Start date: March 6, 2012. Salary: $9.58/hour. Melinda Burton, Rogers food service. Start date: March 7, 2012. Salary: $9.84/hour. Dana Craft, Anson food service. Start date: March 8, 2012. Salary: $9.84/hour. David Case, Jr., MHS assistant girls track coach. Start date: Jan. 16, 2012. Salary: $3,190/year. Sharon Baughman, administrative assistant to the associate superintendent. Start date: July 1, 2012. Change from administrative assistant for technology. Renae Devenney, 12-month secretary at Lenihan. Start date: July 1, 2012. Change from 10-month secretary at Lenihan. Jasmine Hazen, Woodbury Title I teacher. Start date: 2012-2013 school year. Change from Title I teacher at MACS and Woodbury. Shelly Seymour, MHS paraeducator. Start date: Feb. 28, 2012. Change from Level III Special Ed to Level I, from $9.63/hour to $8.63/hour. Kerri Rubenbauer, Woodbury Literacy Intervention Tutor. Start date: Feb. 6, 2012. Change from 6 hours/day to 7 hours/day (extra hour at Fisher Elementary). John Saunders, bus driver. Start date: Jan. 30, 2012. Salary :$637.80/month. Change from substitute to regular route. James Johnson, bus driver. Start date: Feb. 7, 2012. Salary: $637.80/month. Change from substitute to regular route. Jean Wilkens, MHS food service. Start date: Jan. 4, 2012. Salary: $11.73/hour. Change from Grade 3, Step 2 to Grade 4, Step 2. 100 District Philosophy, Mission, Beliefs, and Expectations, approved. 101.1 Long-Range Needs Assessments, will return as a Second Reading. 200 Statement of Guiding Principles, 201.2 Legal Status of the Board of Directors, 201.3 Responsibilities of the Board of Directors, 201.4 Elections, 201.5 Membership, and 201.6 Term of Office were marked as reviewed. 201.7 Organization of the Board, will return as a First Reading. 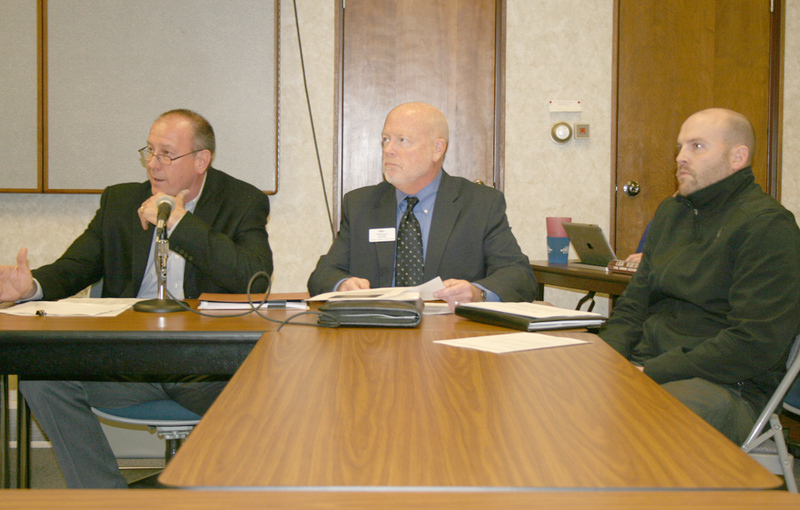 Representatives from the Marshalltown Business-Education Alliance share their mission and goals with the Board of Education (L to R): Terry Buzbee, Fisher Controls (co-chair); Dr. Chris Duree, Iowa Valley Community College District (co-chair); Mike McQuade, JBS. The Marshalltown Area Chamber of Commerce, Marshalltown Community School District (MCSD), and Iowa Valley Community College District (IVCCD) and area business leaders are excited to announce the creation of the Marshalltown Business-Education Alliance. Actively engage business leaders and educators to determine the skills needed in the workplace. Improve community perceptions and attitudes about education. Develop a unified front to ensure parents recognize the value of education. Provide “one voice advocacy” for policies and issues affecting education excellence. The Alliance includes several area business leaders, representatives from MCSD, IVCCD, the Chamber and the Marshalltown Education Association, who have worked together since October 2011 to identify common focus areas above and will continue working to strengthen connections between business and education, and engage key stakeholders in the fulfilling the mission. During the month of March representatives from the Alliance will be visiting with various stakeholders in the area to talk about the mission and goals of the group. The Alliance is chaired by Terry Buzbee from Fisher Controls/Emerson and Dr. Chris Duree from IVCCD. BLITS members (L to R) Kyle Carnahan, Paul Fienup, Connor Ruddick and Austin Hauser tell the Board about their activities. Students from BLITS (Bobcat Leaders Influencing Their School) came before the Board Monday night to be recognized for their positive impact on Marshalltown High School. BLITS began last year with a small group of male student athletes meeting at Scott Carnahan’s home, talking about what it means to be a good leader. The group held dances and fund-raisers to add $6,000 in improvements to the MHS weight room. This year there are about 40 members of BLITS. They are currently raising money to purchase a new scoreboard for the Roundhouse. A new rubber tile surface will be installed on the Hoglan Elementary intermediate playground, funded in part by the school, the Parent-Teacher Organization, and PERL funds (Public Education Recreation Levy). The same project was done on the primary playground during summer 2009. The rubber tiles, which are made from recycled materials, provide a better cushion for falls and have less long-term maintenance costs than traditional gravel and mulch. Team Hoglan, the elementary’s PTO, has raised $13,000 for the project, with Hoglan Elementary contributing an additional $10,500. The remaining $24,369 will be allocated from district PERL funds. The project should be completed by the 2012-2013 school year. The school tax rate per $1,000 valuation will decrease 18 cents in the proposed 2012-2013 budget. The new tax rate of $17.47 won’t necessarily equate to lower taxes, however, as property valuations are increasing in the district. Kevin Poskeany, director of business operations, said the new numbers will equate to less than a 1.5 percent increase in taxes. The Board approved seeking bids to demolish the 1925 building at the former Anson Middle School. The project will cost approximately $600,000. Policy 100 contains primary components of the District’s four-year Strategic Action Plan, including Mission, Vision, Beliefs, Goals, Objectives, Strategies, and measurable Indicators of success. Policy 100 tells us where we are to be going, when we should get there, and what criteria will be used to determine if our efforts are successful. The Marshalltown Business-Education Alliance is a partnership between the Marshalltown Community School District, Iowa Valley Community College District, and the local business community committed to drive the successful execution of the partners’ strategic plans, achieve measurable results, and be the education system of choice. This Mission states that business and education will work together to attain the goal and objectives of the strategic plan (as outlined in Policy 100). MCSD is not alone – Iowa Valley Community College District and the local business community are strong and supportive partners of our continuous improvement efforts. As mentioned following our last board meeting, I look forward to reporting the progress our students will make over the next several years – and to celebrating the success that will result from the collaborative effort of dedicated students, parents, staff, and community partners. This evening’s Board meeting began with a presentation that really underscored for me, once again, what an impact a few determined young people can have. Bobcat Leaders Influencing Their Schools (BLITS) is a sizeable self-organized group of male athletes who meet regularly to focus on leadership development and on ways in which they can bring about positive changes in their school environment. Yes, their projects have focused on athletic facilities; athletics are a huge part of their world. The point is that they have chosen to become actively involved in school leadership and in providing solutions to needs that they identify in their world. They do the fund-raising (sizeable amounts, too! ), they are the organizers, and they contribute their own “sweat equity” to their projects. They truly get what “citizenship in a changing world” means. Hats off to these young leaders! Sadrac Aleman, Fisher/Woodbury ELL Teacher, effective at the end of the 2011-2012 school year. Has taught in the district for 1 year. Matt Moffitt, MHS Chemistry Teacher, effective at the end of the 2011-2012 school year. Has taught in the district for 3 years. James Bennett, computer tech/auditorium assistant, effective March 2, 2012. Kathleen Ohrt, Franklin/Rogers Literacy Intervention Tutor, effective Feb. 28, 2012. Susan Nugent, MHS cheerleading coach, effective March 31, 2012. Armando Torres, Lenihan bilingual tutor, effective Feb. 29, 2012. Sherry Glenney, substitute bus driver. Wilma Perkins, bus monitor, salary: $9.35/hour. Pete Drury, head 7th grade boys track coach. Start date: March 5, 2012. Salary: $2424/year. Scott Smith, MHS assistant boys tennis coach. Start date: March 5, 2012. Salary: $1914/year.